"Don't take anybody's eye out now," joked a faculty avatar. "I'll try not to," the student avatar said with a chuckle before continuing his transit-oriented development (TOD) presentation. "With increasing [housing] densities in the [transit] corridor, I think there's a potential to consolidate the urban space and take [other] areas back to agriculture and cultivation." 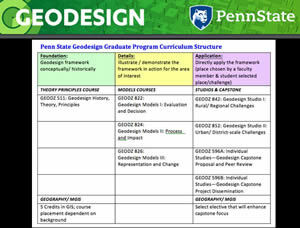 Welcome to the cloud-based environment for teaching geodesign at the Pennsylvania State University (Penn State) World Campus, where students learn to make what the university calls "geospatially oriented" design decisions. 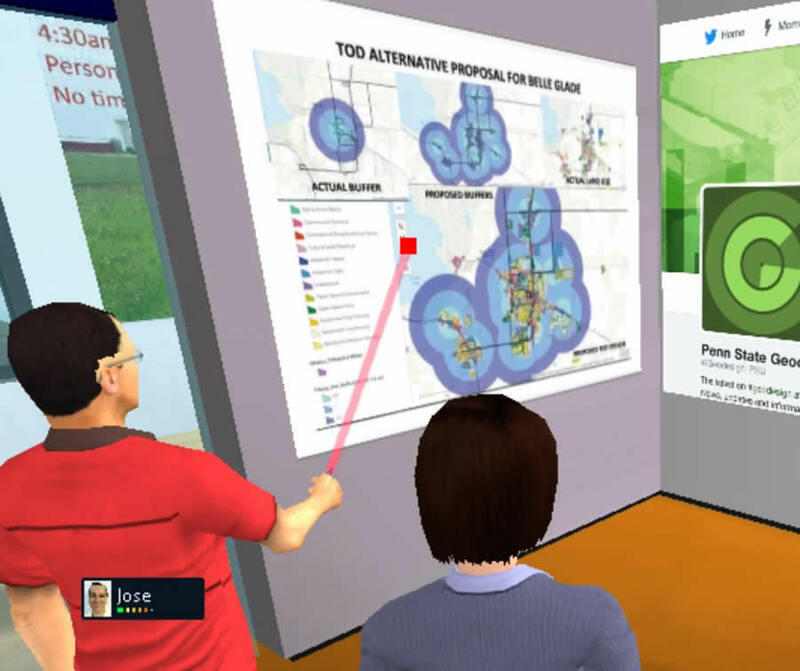 Students can earn either a 35-credit Master of Professional Studies in Geodesign degree or a 14-credit Graduate Certificate in Geodesign online, collaborating on assignments and making final presentations to faculty and classmates in a 2D/3D virtual classroom, such as Terf. Students and faculty also communicate using other Internet-based communication tools such as Skype and Yammer. It's the next best thing to being together in one room. "All of our courses are offered online, so people can participate from wherever they are—they don't have to relocate," said Kelleann Foster, director of the Stuckeman School of Architecture and Landscape Architecture at Penn State and the faculty leader of the school's geodesign program. "So much is happening in the cloud now that it has actually become easier to deliver the program online." In its broadest sense, geodesign combines the art of design with the science of geography. Using stakeholder input, creative design techniques, rigorous methodologies, and spatial analysis and mapping, a geodesign practitioner can find the most suitable, environmentally friendly, and sustainable options for how to use space. That may be space for development, agriculture, wildlife conservation, transportation or flood control systems, marine protected areas, and so on. 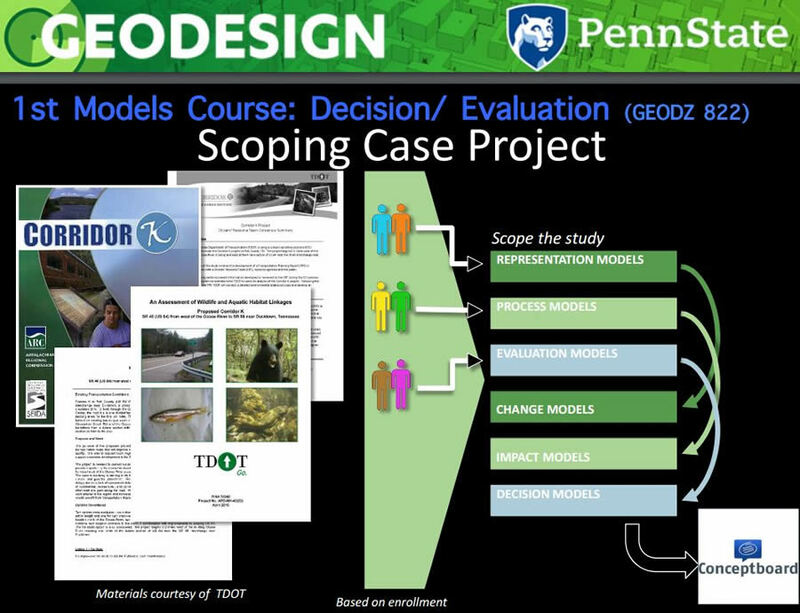 "Geodesign means using GIS and other predictive models to help make decisions about how you design the landscape," said Dan Meehan, geodesign program manager for Penn State. "You have a problem and you need to address it and fix it. If you propose a fix, what are the impacts on all the different systems—not only physical systems [such as transportation] but cultural systems, political systems, and ecological systems?" "There is so much information out there, but we are not doing a very good job designing places and planning for conservation and all these things we need to do on the land," said Foster. "So there is a need to have a design process to understand what data you need and who you need to work with to have successful planning solutions, no matter what land planning and design challenge you face." The students use GIS to evaluate their design scenarios. 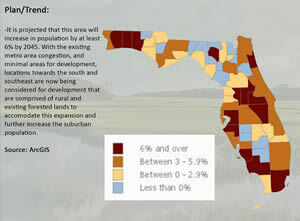 For example, master's degree student Shannon McElvaney used modeling and analysis tools in ArcGIS for Desktop, ArcGIS Online, and GeoPlanner for ArcGIS to analyze where to locate TOD in Miami-Dade County, Florida, in 2040, taking into account 330,000 households that the county projects will need to be added by then and the probability of a higher sea level. For that assignment, Penn State faculty member Michael Flaxman, who taught the master's degree course Geodesign Studio I: Rural/Regional Challenges, stipulated that the students create TOD proposals for various areas of Florida. "[TOD means] the placement of residential and mixed-use development that decreases the total vehicle miles driven and increases the use of public transit," said Flaxman. The question was, "where can we grow?" said McElvaney. He had to factor in many constraints, including protecting green infrastructure and accounting for sea level rise that is projected to leave some areas near the coastline and even some land inland unsuitable for development. "I couldn't believe how drastic it was and how much land it overtook," McElvaney said during his final presentation, which the faculty and his classmates all participated in online. "You could see [how] it started to creep in on the agricultural area . 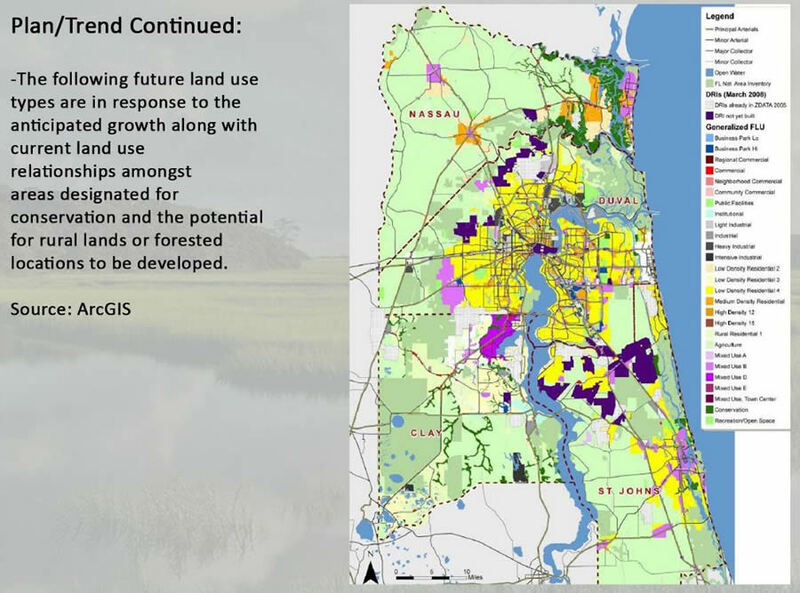 . . so suddenly [where it] looked like we could back away from the coast and develop more inland [but that land] also gets inundated." "I love fixed rail, but it's going to be dangerous to invest money in it along the coast," he said. Flaxman said he was impressed with the work done by McElvaney and the other students in the class. "The primary [objective] was to become comfortable with large problems and large spatial scales," said Flaxman, who also has taught at Massachusetts Institute of Technology (MIT) and owns Geodesign Technologies Inc. in Berkeley, California. The students, Flaxman said, had to understand their assigned regions' plans and trends and then strategically intervene to improve the plans. "They came up with some good design solutions that faculty wouldn't have thought of," Flaxman said. 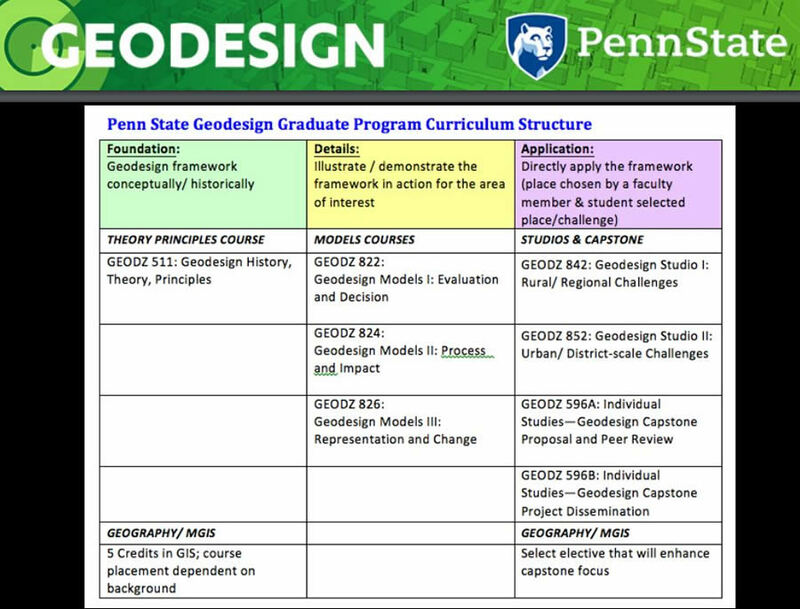 One of the required textbooks in Penn State's geodesign program is A Framework for Geodesign: Changing Geography by Design, authored by Carl Steinitz, professor emeritus of landscape architecture and planning at the Harvard Graduate School of Design, and published by Esri. Steinitz's framework for the geodesign process is shaped by a set of six key questions: How should the landscape/study area be described? How does the landscape/study area function? Is the current landscape/study area working well? How might the landscape/study area be altered? What difference might the changes cause? How should the landscape/study area be changed? 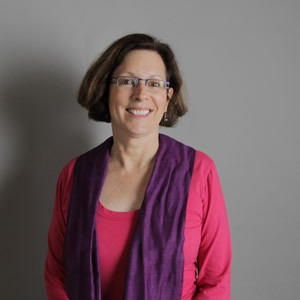 Foster said she was inspired to start the geodesign program after seeing Steinitz's geodesign framework in action when he was a visiting professor, serving as Penn State's Eleanor R. Stuckeman chair of design in the fall of 2011. He taught a geodesign studio, and Foster said she was impressed with how well the process worked. "I was sold," she said. "Students accomplished more in four or five weeks than they typically do in a 15-week semester." According to Steinitz, those affected by any proposed design change—he calls them "the people of the place"—should have input in the process. 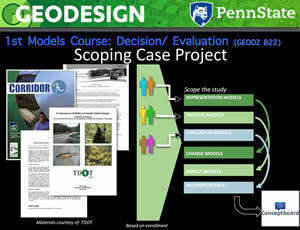 That's what the Penn State students learn how to do in another course, Geodesign Models I: Evaluation and Decision. Students in that class are asked to tackle another real-world conundrum involving a portion of Corridor K, a proposal to improve the highway system that stretches from Cleveland, Tennessee, to Dillsboro, North Carolina. Officials are weighing several design alternatives as they try to meet transportation needs while protecting an environmentally sensitive area called the Ocoee River Gorge. "An important part of our program is the people part," Foster said. "If you are going to design something on the land and you are not accounting for all the different interests, issues, and values that people hold for the place . . . you are not going to get very far with the project." 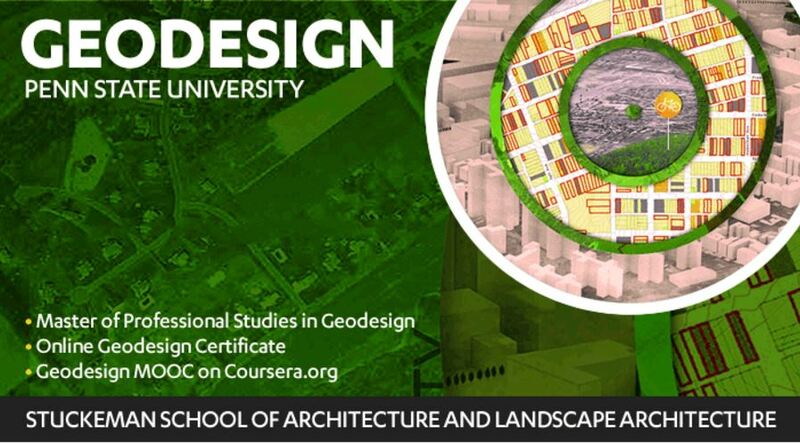 Both the certificate and master's degree programs require geography courses as needed, along with classes on geodesign history, theory, principles, and models. 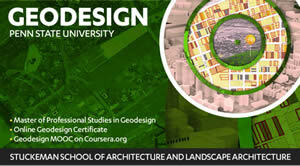 The master's degree students also take Geodesign Studio I and II and complete a capstone experience that involves preparing a student-selected, peer-reviewed geodesign project and then either present it in a formal venue such as a conference or author an article about it for a professional publication. "What I think is so powerful about geodesign is [that] once you know this process, it's transportable," said Foster. "You can apply it to many different situations. And even as the technology changes and evolves—which it does, every year—you will know how to plug the newest technology and newest ways to acquire the data into this framework in order to go forward with decision-making and [getting] the rapid feedback on the impacts and potential consequences." "That is so old school, especially with place-based projects," she said. "You have to be able to understand how to work with a variety of people. To ask the right questions and get the right information from them is essential to the outcome."